Free shipping and voucher codes to make savings on men’s shirts, suits and ties at tmlewin.co.uk. Shop in the sale and save up to 60% with guaranteed next day delivery available. Free click and collect from store with a free voucher when you collect, free returns and express delivery as standard. Offer applies to Standard Delivery saving £4.95. Sent on a 2-3 working day service. 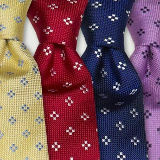 Ties for only £15 in the Sale. TM Lewin was founded back in 1898 and was based in Jermyn Street, London. Jermyn Street is renowned for housing the world’s finest tailors. Over a century ago, it was not usual for shirts to have buttons down the front. This is where TM Lewin came into its own by prototyping the first modern style shirt still worn today. A lot has changed over the years but quality craftsmanship, excellent service and good value still hold great importance with the TM Lewin brand. They continue to use the same manufacturing techniques developed and after all those years, the quality and innovation of the Lewin brand remains among the best in the world. TM Lewin has nearly 100 stores throughout the UK and new overseas stores planned in countries including Europe, and Asia. The shirts are manufactured using the best quality 2-fold 100% cotton, extra reinforcing the buttonholes and providing a selection of collar shape, double cuff choice and different sleeve lengths to ensure the perfect fit and quality. As well as the quality clothing there’s a 90-day No Quibble Guarantee on offer for total peace of mind. In the event of a problem then customers can exchange the item or get a full refund. Just return the item with your receipt or recent invoice, within 90 days of purchase. Unfortunately at the time of writing there are no free home delivery options available. Free click and collect from store is available from 70 stores nationwide that will be ready to collect within 2 to 5 days. Payment options include debit/credit card and PayPal checkout. OK let’s take a look at the TN Lewin online store. The website is a simple design which enables users to quickly find their way around the site without too much distracting content. On the main header there’s user tools for logging into accounts, Signing up and store finder links to help find a local store in your area. The main product menu is clear and concise showing links to new-in and offers pages plus links to all the product categories enabling quick navigation and lastly a link to the blog page. Below the main menu there are latest offer banners, product images plus delivery and returns links. If you’re a social type you can find links to all the popular social media sites such as these examples. The footer gives users access to help, delivery information, size guides, and contact details. OK let’s look at the buying experience. In this example I’m going to buy a shirt, yes I am a man! You can choose the product either by clicking on the image or quick buy links, both serving the purpose of choosing the product. I’ve got options of collar size, sleeve length plus a sleeve length adjustment where you can adjust the length in half inch increments. Then simply choose your quantity and add to bag, at the time of writing, there is also a multi-buy price offering a discount off the price per item. Proceeding to the checkout there are options to change the quantity, adding a voucher code by typing a special codes into the promotion field, now that’s where we come in.